Pembroke in south west Wales stands on an elevated ridge that runs into a creek at the southern edge of Milford Haven. The town consists of one long street, stretching from east to west of the ridge it stands on. In 1818 an act of Parliament authorised commissioners to establish a market at the dock in Pembroke. 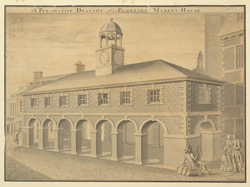 The original market took place in the ‘weighing house’ which was built in 1826. The naval authorities paved the road outside the building making transportation of goods to and from the market far easier. The market had no roof until 1886 and so trade suffered when it rained.